In one of the most important battles of the war, American naval forces, under the command of Commodore MacDonough, defeated a British fleet at Lake Champlain. With the war in Europe over, the British gained an additional 18,000 troops in Canada. The British commander, General Izard, decided to invade the United States through Lake Champlain. Commanding the American Naval forces was Lieutenant Macdonald. Izard was called to the Niagara front with 4,000 men. The New York called for its militia to fall out in mass. Only 700 hundred militiamen answered the call. They harassed the British as they advanced, but could do little more. On September 6, General Macomb sent two detachments of regulars each with 200 men to delay the British. The regulars were successful in delaying the British. They fought brief encounters with the British and then fell back in good order. The British neared the main American line on the south side of the Saranac River. The Americans had removed the planks over the river and the British were unable to cross. Under these conditions British commander General Prevost decided to await arrival of British ships to support his assault on American lines. While the British were awaiting the arrival of their naval support, 2000 Vermont militia arrived to aid the American forces. Macdonald prepared to fight the navy battle from Plattsburg Bay. He organized his ships in such a way that the British would not be able to fight from a long distance, thus minimizing the British advantage in long guns. On the morning of September 11 the British fleet commanded by Captain George Downey arrived. The British fleet consisted of 16 vessels. The British approached the American stronghold and the HMS Confiance opened up a full broadside on the lead of the USS Saratoga. Before long both the British and the Americans had lost one ship and most of the American ships were badly damaged. MacDonald previous plan now came into play. The undamaged side of the American ships now faced the British ships that were unable to counterattack. The Americans opened with a total broadside and the Confiance was forced to strike her colors. Three other British ships were soon lost and soon the battle was over. The Americans had won one the most important battles of the war. 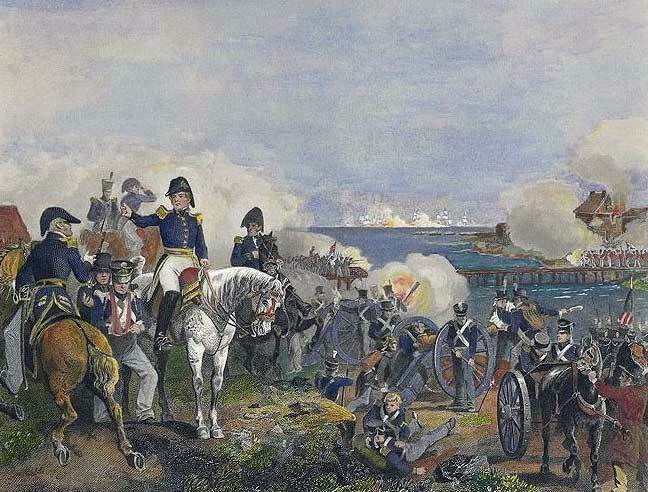 Once the naval battle was over, the British had no choice but to turn around and return to Canada.